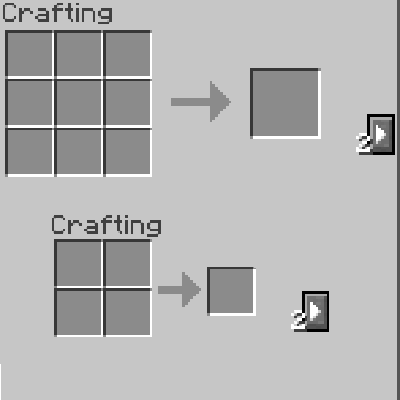 The button gets drawn in the crafting table UI. Setting offsets in the config (like putting horiztonal and vertical to 10) properly moves the button. When a conflict is found the button changes state. The number of conflicting recipes appears over the button properly - that is it says 0 normally but for something like trapdoor vs ghostwood trapdoor it shows a '2'. Setting the 'render text tooltip' option to 'true' hides the number but when it would be non-zero the text "handler.found.text" appears in the upper right hand corner of the screen. Setting 'enable switch key' to True adds a RecipeSwitch entry to the Controls UI that is bindable to a key. However, when a conflict is detected: clicking on the button just makes a 'click' sound, while pressing the bound key doesn't do anything at all. Have you thought about porting this mod to fabric loader and for use on latest snapshot 19w09a? Just curious, I would love if you could or would. I encounter something while playing. I use UniDict to unify my stuff. Some recipes don't display the things I set in preferred ModID list by default. Would it be possible to add a list like this to the config? So that so recipes displays the wanted items by default. You may want to update Bibliocraft or notify its mod author. It seems to have a bug relative to the inventory interface in its Disc Tray TileEntity. Meanwhile i'll add it to the default container black list. Great mod, but for some reason, when this mod, it completly breaks chests and furnaces. Chests loose their contents when re-opening them, same for furnaces. Furnaces also are no longer able to smelt and cook items with this mod, please fix this! Are you sure it's this mod? I am trying it myself and I have not had that issue yet with the vanilla chest and furnace. Maybe there is a conflict with another mod and this one? How can I know the name of the container to lock the workbench out of another mod, like TC? Can you move the numer at left? My friend, you have saved the day! My mod pack had three base component conflicts that basically threatened to make it unplayable. Your mod stopped that. The crafting station and item panel from enderio? I like this mod as well, thanks for your hard work it's made my modpack a lot more enjoyable.....I would love if you added AppliedEnergistics2 ME Crafting Terminal and Pattern Terminal Support. would Just be nice to have it is all so i can get rid of vanilla crafting table in my base :D...again though its an awesome mod! Thanks for this mod, im putting together a pack and this is exactly the help I need. Thanks again. https://minecraft.curseforge.com/projects/ordinary-coins?gameCategorySlug=mc-mods&amp;projectID=281246 and modpack owners can and will have a way to use broken recipes. I really need this in the pack I've put together, but it's not available and I think if I manually add it, I won't be able to sync it to all my players.